The Transfer Of Property Act 1882 and Registration Act, 1908 prescribe compulsory registration of certain documents. Transfer of Property Act mandates that certain documents to be valid; they should give “notice to the world”. Registration Act, 1908 gives the mechanism to the concept of “notice to the world”. The documents registered in Book 1 of Registration Offices are public documents, so any public may inspect such book; get copies of the same and a list of details of registered documents chronologically in the shape of an Encumbrance Certificate (EC). Documents affecting immovable property through sale, gift, partition, release, mortgage, lease, sale agreement are some of the compulsorily registrable documents. Registration Act is one of the oldest legislations made during pre-Independence period that are being implemented in almost all parts of the country without altering substantially for the last 200 years. Records containing the copies of registered documents in Registration Offices are permanent in nature (philosophically speaking they have to be preserved for eternity); therefore, record preservation is one of the prime objectives of the Registration Department. Civil courts heavily depend on the records of Registration Department in deciding the issues like title, ownership, possession of immovable properties. Majority of parties invariably approach solicitors, advocates or professional document writers to get their documents prepared; and, at times, also for registration. But, it is better to know some of the important aspects of document and its registration so as to check whether the person who is entrusted with its preparation and registration is acting properly. One must know that the Transfer of Property Act and other civil laws in India keep the onus on the purchaser/beneficiary under the document to take all the responsibility of verification of the title, ownership, possession of property. It is not the responsibility of the Registering Officer or Registration Department to check all these aspects. The role of the Registrar or the Department is very limited in these aspects. The Registrar is empowered to verify certain issues but such power is limited and he cannot undertake roving enquiries. Therefore, it is the purchaser who must take all steps and precautions to record all the recitals/covenants properly pertaining to the transaction in the document; and get it registered as per the provisions of Registration Act, 1908. The mistakes in documentation may result in civil disputes and the parties have to undergo mental and physical strain besides incurring financial loss. “A stitch in time saves nine” is an apt phrase for documentation. Document is the final product of the transaction. The intent and objects of the transaction which may be part of mental design will go waste if you could not record properly the same by using proper and appropriate language/recitals in the document. If there are any blanks, erasures, interlineations and alterations in the document, the parties shall attest them with their signatures or initials. So, please check whether there are any blanks, erasures, etc; in the document which require attestation by the parties before submitting it to Registrar for registration. Property shall be described with full details to identify the same without any ambiguity. In case of agriculture property, the survey number (old and new), full extent of survey number, and if part of it is transacted then all the four boundaries of the property, extent of property under transaction, village name, panchayat name, mandal name, district name shall be written clearly. The details like pattadar pass book and title deeds may also be recorded to link the ownership with the details of property. In respect of house property, the details like door number (old and new), assessment number of the property, street name, and village/city name shall be mentioned. In respect of vacant lands situated in remote places the property description requires a lot more caution and effort. The people are cheated by fraudsters by creating multiple documents by selling the same property with various descriptions. It is in the interest of the buyer, the description of property must be full and complete. It is better to avoid vague description of boundaries like “neighbour’s property”. Make genuine efforts to know the current owners of the properties abutting the scheduled property and record in the document. Property description is heart of the documentation as ultimately the Registration Department converts these details into index particulars; and also uses to generate,Encumbrance Certificate (EC). Accuracy of these details will result in proper indexing and help people to know the registered transactions on the property. Purchase or otherwise dealing with the government, assigned, wakf, endowment, scheduled areas (1 of 1970 Act) lands is prohibited and entails criminal proceedings. Therefore, it is advised to check and ensure that the property under transaction is not one of these lands. Document other than will deed shall be presented for registration within four months from signing by the parties. In case of delay in presenting within the stipulated four months citing unavoidable circumstances by the parties, the Registrar may condone the delay after collecting the penalty. But in any case, the delay shall not exceed four months. That means a document shall be presented before the concerned Registering Officer for registration within four months without any penalty; and within eight months by paying penalty. But no document shall be accepted for registration after lapse of eight months from the date of signing (execution) by the parties. Therefore, the parties are advised to present the document before the Registering Officer concerned at the earliest possible day after execution of the document. In respect of document executed outside India, the document can be presented for registration before the jurisdiction Registering Officer within four months after its arrival in India. The party presenting the document may have to prove to the satisfaction of the Registering Officer that the document was received in India on a particular date with documentary evidence like courier delivery receipt, affidavit from carrier of the document, etc. There is no time limit to present will deeds. A will can be presented for registration even after 50 years. A Will can be presented by the beneficiary/executor even after the death of the testator/testatrix. The Registering Officer will conduct enquiry as per the provisions of Registration Act, and may register the will if he is satisfied that the will was properly executed by the deceased testator. Person signing the document is called executant of the document. The executant can present the document for registration. If there is more than one executant in the document, then any one of the executants can present the document. But admission of execution shall be done by all the executants. The claimant (beneficiary) may also present the document. Any attested power of attorney holder may present the document. Attested power of attorney comes into picture when the document which shall be registered is actually signed by the principal but due to certain reasons, if the principal is not in a position to present and admit the execution before the Registering Officer, then the principal gives the power to the agent authorising him to present and admit the execution of the document, which the principal has signed. This power requires attestation. This power shall be attested by the Sub Registrar of the area where the principal resides if he is in India where Registration Act, 1908 is in force. If the principal resides outside India, then the notary public/Consul/Vice-Consul of India shall attest such power of attorney. To make it clear, once again, it is to inform that the attestation is required in case of the power authorising the agent to present the document executed by the principal; but not in the case of the general power of attorney which authorises the agent to sign on behalf of the principal. When the Agent signs the document on behalf of the Principal, he automatically becomes the executant, so he presents the document in the capacity of executant. Such general power of attorney is optionally registrable document; and if parties wish to get it registered, they can get it registered. A power which requires attestation, even though it is registered as per the provisions of Registration Act, 1908 instead of attestation, shall not be accepted by the Registrar/Sub Registrar as it is incurable defect. 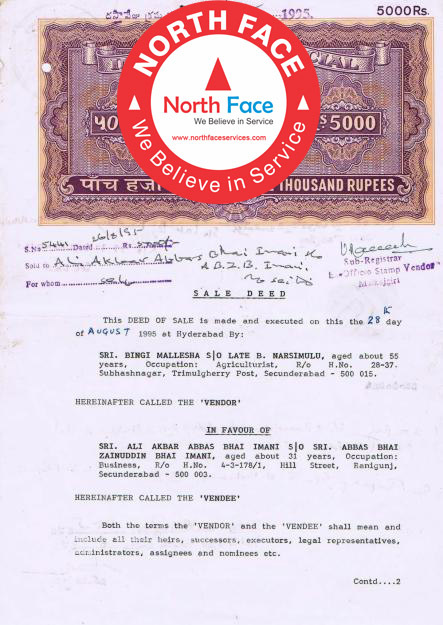 In respect of sale deed, the photographs and fingerprints of both the seller and buyer shall be affixed in the prescribed format under Section 32A of Registration Act, 1908. In respect of other documents, the photograph and fingerprints of presentent shall be affixed. A map/sketch shall be enclosed with the non-testamentary document affecting immovable properties clearly drawing the route leading to the scheduled property. This route map shall be drawn so that even a stranger can locate the property by using the landmarks mentioned in the map. The map must indicate where exactly the property is located and the nearby landmarks such as post office, police station, temple, mosque, chowrastha etc. Along with the document, the parties shall also enclose copies of address proof of the executing, claiming parties, attesting witnesses and identifying witnesses. The address proof recognizable by the department includes passport, ration card, Aadhar card (UID), bank passbook containing the full address of the person, driving licence etc. The parties shall produce pattadar passbooks and title deeds issued by revenue department if the document affects agricultural land. This entry was posted in News and tagged Construction Monitor Hyderabad, Construction Quality Check Hyderabad, Property Management Hyderabad on May 26, 2016 by Venkat Chunduru.